Has Meizu's quick charge tech reinvented the smartphone? Do you carry a portable charger for your smartphone? They seem innocent enough, but those small black boxes are like a sticking plaster over the tech industry's gaping wound; pathetic phone batteries not fit for the modern mobile age. It's not just the Pokémon Go app that drains the life from smartphones, with navigation apps like Google Maps, firmware updates, and even just the camera app eating away at battery life at a worrying rate. So could a claim by Chinese phone maker Meizu that it now has the technology to recharge a phone in less than 20 minutes change everything? Short battery life is a huge problem for the phone industry, whose minor improvements in power efficiency have been swallowed up by the ever-increasing size of smartphone screens. "Smartphones have become more power-hungry, and battery life and charging technology has failed to keep pace, leaving users often unsatisfied with the battery life of their devices," says James Manning Smith, Information Analyst at Futuresource Consulting. He points out that manufacturers have three choices when designing a phone; larger batteries in devices, more efficient components, and making charging more convenient for users. Meizu has taken the middle road with its Super mCharge technology, which it unveiled at a press event at Mobile World Congress 2017 in Barcelona. The live demo saw an empty smartphone fill-up in precisely 18 minutes and 55 seconds. Not exactly a riveting watch for onlookers, but impressive nonetheless. After over a year of R&D, said Meizu, it had improved the power of a Super mCharge battery to 55W, and accelerated charging speed by 5.5 times. That 55W figure is key. “Meizu's 55W charging is a first for the mobile industry,” says Manning Smith, who confirms that it's a more powerful charging solution than anything already on the market. The battery inside the Meizu demo phone was 3,000mAh, which is a typical size for a smartphone (for comparison, the Samsung Galaxy S8 uses a 3,000mAh battery, while the iPhone 7 claims a 1,960mAh battery), though this one was specially designed by Meizu's engineers to bear more than four times the current so it could work with Super mCharge. So what has Meizu actually achieved here? As well as taking charging to 55W, Meizu has dramatically accelerated the charging speed. Technically speaking, Super mCharge uses charge pump technology; comprising two groups of circuits, the charge pump exports half of the voltage after transformation and improves efficiency by 8%. "Our solution yields 98% efficiency, compared with other companies who struggle to hit 90%," claims Meizu. Super mCharge also uses a USB cable that's been redesigned to carry up to 160W of power, and as a result it does cost three times more than a regular USB cable. Can the Meizu phone stand the heat? There are two immediate concerns. Firstly, does fast charging mean the battery won't last very long? Secondly, is all that extra heat generated safe? After all, exploding batteries in smartphones like the Samsung Galaxy Note 7 have made us all nervous. On the first question, Meizu insists that in tests its 3,000mAh battery retained more than 80 percent of its capacity after 800 charge and discharge cycles, so it should be good for two years' normal use. On the second concern about safety, Meizu claims that its optimization algorithm means the highest temperature the battery reaches is 39°C/102°F (in an ambient temperature of 22°C/72°F), just a bit higher than body temperature. 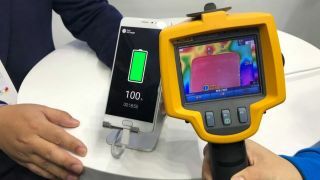 Manning Smith explains that since smartphones are very condensed devices, engineering restrictions mean the heat that builds up during high-powered charging can damage the battery, and other components in the phone. "Meizu has developed a technology that allows the battery to be charged at a very high rate, without exceeding dangerous temperature levels," he adds. This is all impressive stuff, but only if the device can live up to Meizu's promises. "Once the technology comes to market, it has the potential to set a new standard for wired smartphone charging," says Manning Smith. That should happen during 2019 or 2020, but there's no guaranteed success for Super mCharge. Not only are several other similar innovations expected in that time-frame, but the general trend towards super-fast wired charging for phones looks set to be overtaken by the wireless charging era. When it comes to super-fast wired charging, Qualcomm’s Quick Charge 3.0 (QC3.0) for Android devices is the current front-runner, with QC4.0 just announced for new flagship Android phones that use the Qualcomm Snapdragon 835 chipset – and that includes the Sony Xperia XZ Premium, ZTE Gigabit and some versions of the Samsung Galaxy S8. QC4.0 claims to charge 20% faster than QC3.0 (which charges an empty phone to 50% in about 30 minutes). That's not as impressive as Super mCharge's promised speeds, but then again it's available already. Can Meizu's technology compete with wireless pads? "Wireless charging companies are trying to [create] a world in which charging cables are unnecessary," says Manning Smith, who admits that support for wireless charging pads in wider society is in its infancy. However, Aircharge has been installing wireless charging stations in restaurants, airports and hotels, while IKEA is including wireless charging pads in some furniture. "Should we see an increase in the availability of wireless charging outlets in our daily lives, there may be less need for fast charging technologies," Manning Smith says. There are also efforts to develop high-wattage wireless charging. Bosch has wireless charging for power tools that it plans to take up to 60W and use in all kinds of mobile devices by 2020, which would surpass Meizu's achievement – while LG has been developing wireless charging pads that bring a fully discharged phone up to 50% in 30 minutes, (so on a par with QC3.0). “The convenience of cable-free, little-and-often charges that wireless charging can provide may be more convincing for consumers than wired, but quick charging,” says Manning Smith. So while Meizu's Super mCharge is an exciting achievement, the future belongs not to electrochemical cells, but wireless charging pads – probably starting with your car. Want to charge less? Get one of these battery monsters.